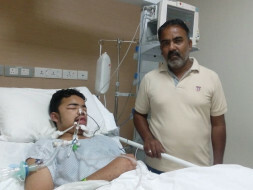 A few days back 18-year-old Manoj began complaining of severe fever and chills and was rushed to the hospital. After multiple tests, he was diagnosed with a type of Meningitis called Meningoencephalitis. 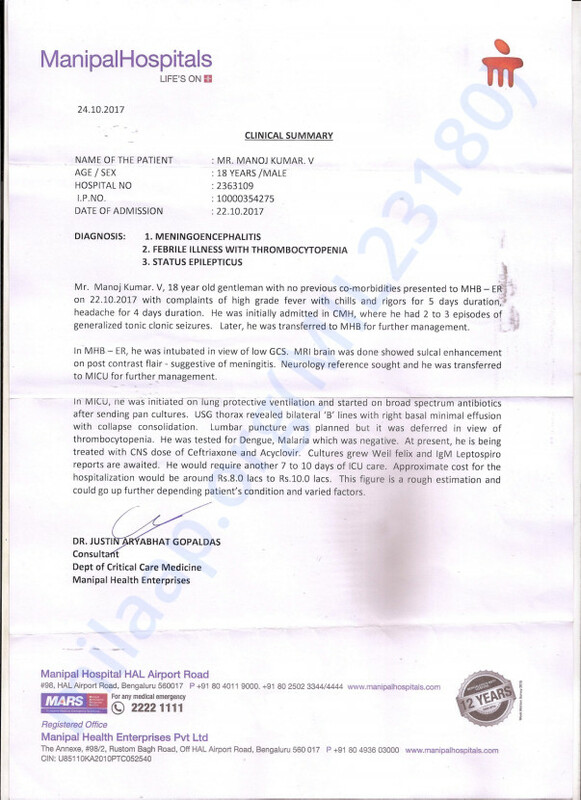 It is a severe infection in the brain which has caused Manoj to be admitted in the ICU. He is now in the ICU in a very critical condition and needs to be in the ICU for the next 10 days where he requires management and treatment of his condition. Your contribution can help save Manoj's life and give him the treatment that he deserves. Here is an update on Manoj. Manoj was brought to Manipal with Dengue illness and with progressing seizures. He was on ventilator support and medical management in the ICU. Gradually was shifted to the ward upon recovery and was discharged too. But on the next day of discharge, he developed slurred speech and drowsiness and was restless. Hence was admitted to ICU again and was treated for metabolic encephalopathy. Because of good recovery was discharged with advice to be on regular follow up. Thank you for your support and love for Manoj. Wish you a speedy recovery! !